Create your side piece — I first took two doors off of a 24″ wide wall cabinet — we used this as the “side” of each what-not shelf and as the structure for the glass to attach to. This was important in particular because on one side, I had only a dead gaping hole corner filler-piece frame to attach to, no cabinet. The doors were each 12″ wide, a bit less than the side of the cabinet — so I set them back a smidgen, it looks fine. If you have full wood cabinets on both sides of your window, you could just attach directly to them and save this doors-from-a wall-cabinet-turn-into-sides-to-set-the-corner-shelves-step. However, if you are doing this with steel cabinets, I think that the extra structural support for the glass shelves is a smart idea no matter what. Find brackets to hold the shelves — To hold the glass shelving, we found shiny chrome brackets from the glass shop used for showers. We attached these to doors that now comprised the side of the what-not, and to the back wall. Install the shelves — We installed the glass shelves. I think we used 1/4 inch but it may have been 3/8. 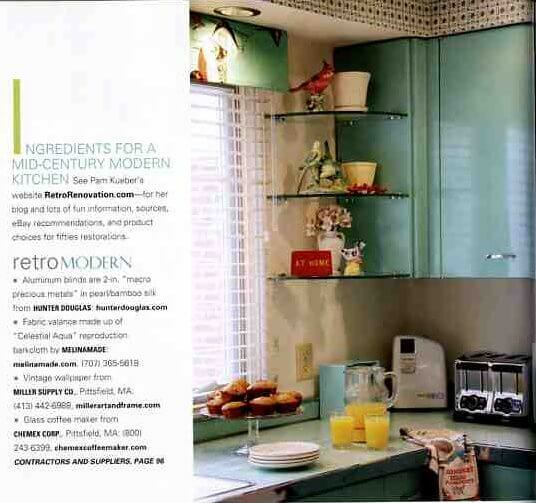 There are lots of choices, we used an aqua glass which is perfect for our cabinets. A honed and polished edge. We cut our glass to size — had to, because one shelf (the one above) is actually 1″ narrower along the wall width than the other, to fill the space. 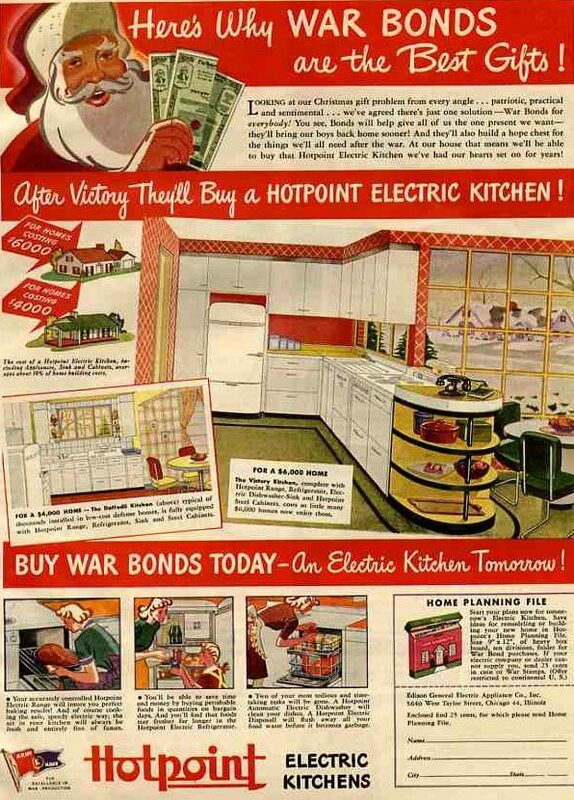 Remember, we were retrofitting someone else’s kitchen into ours. Things were off by only 1″, a miracle — and even more so after you consider we put in the new big picture window and casements including fitting into the front brick configuration. Welcome to another episode of this old house anxiety. These shelves were actually a great solution to optically managing the difference. You’d never ever notice. The glass was wicked expensive. Like, $800 total. But it looks fabulous, makes a huge difference. Wood shelves would have been cheaper, but then I would have wanted them edged in stainless steel. Money one way or another. The glass is light and bright – better – especially in my steel kitchen. 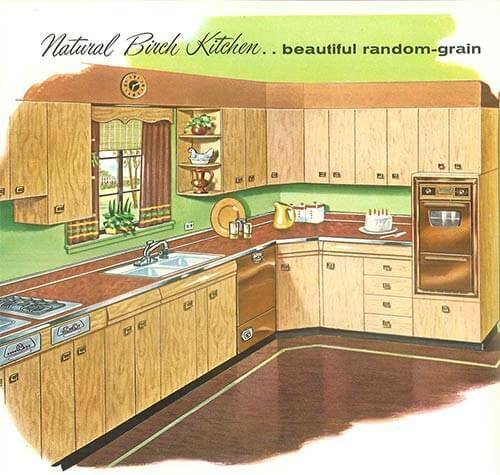 And remember, all my cabinetry was salvaged — quite inexpensive considering the number and quality of cabinets I used, so I felt like I had the wiggle room to “spend too much” in a few other places. If you have wood cabinets, on the other hand, wood cubbies would be fine, I think, you can do this for $60 or less – with 12″ x 12″ wood quarter-round shelves widely available from Home Depot, Wal-Mart etc. Or, make them yourself – from extra cabinet doors would be great because then the thickness would be the same. I love my what-not shelves. They make the kitchen feel more spacious — the window is further visually expanded and in fact, there IS more space for light to come in. Also, when you are at the sink, in particular, it’s nice not to have a big block of honkin’ wood cabinet on top of you. If you’ve got the space, I think it’s best to see if the full “quarter” 12 x 12 or 13 x 13 will work – more space for cute things, more open. But if you’ve got a smaller kitchen, smaller shelves as in the top photo may be better. This is another decision to make based on scale. I have another question for those with laminate countertops if you don’t mind. We have white now from the last owners. They put it in to sell the house and it already has scratches -we have only been here since July. My question is- is it all the same? Or are there different levels of scratch-resistance? I saw 12″ quarter round glass shelves at Lowe’s last week for under $18. ea. The hardware- mounting brackets didn’t look 50’s that much. Brushed nickle- 2″ roundish. I think I’d just buy some different squarish chrome ones for a few more bucks. Thanks, Maurice — sounds like a great resource! No Lowe’s near me here, but next time I’m visiting family in KY, I’ll go looksee. Glad I came across this old post! 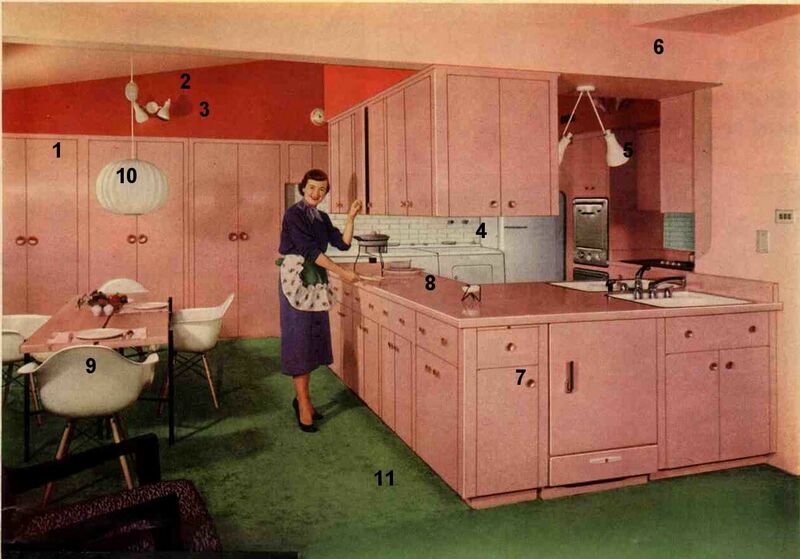 I’d like to install “corner cubbies” either side of the window when I retro-renovate my 1948 kitchen. 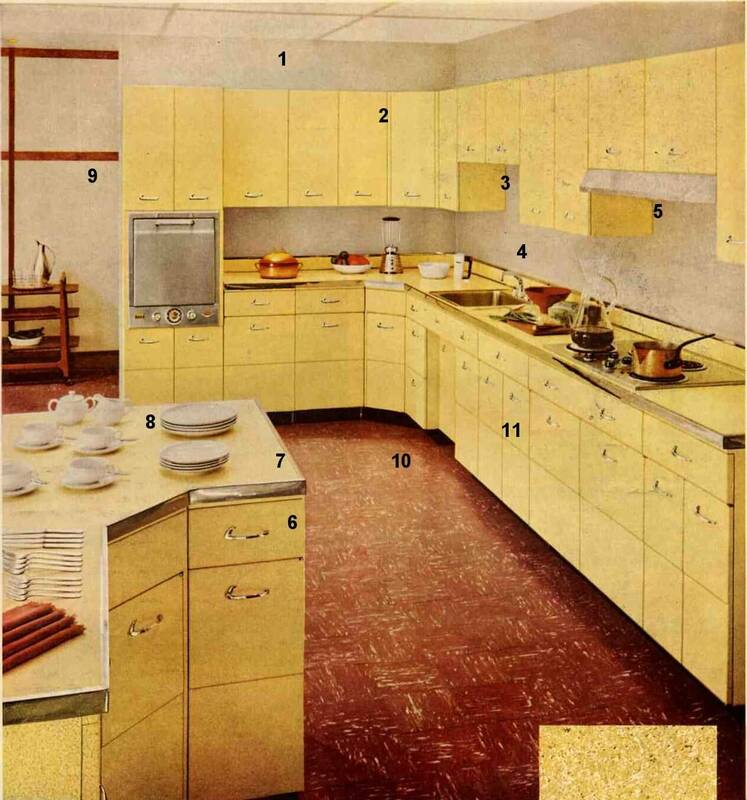 Would love to perhaps see another post all about these shelves, in terms of their popularity and authentic ways to style them (plants and teapots seem to be common in old ads). 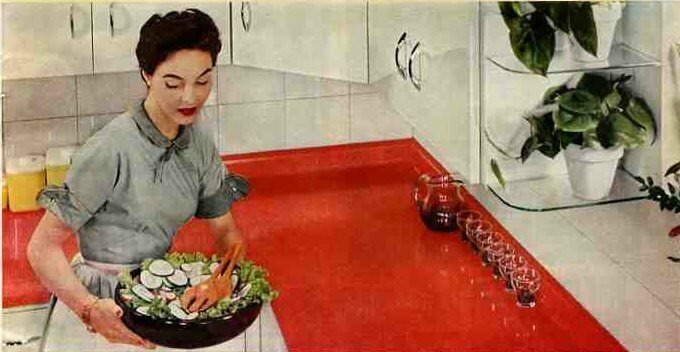 They seem to me to be an iconic element of mid-century modest kitchens. One spot of openness among all the fitted cabinetry. Stark contrast to the no-uppers-all-open-shelving trend we see today!